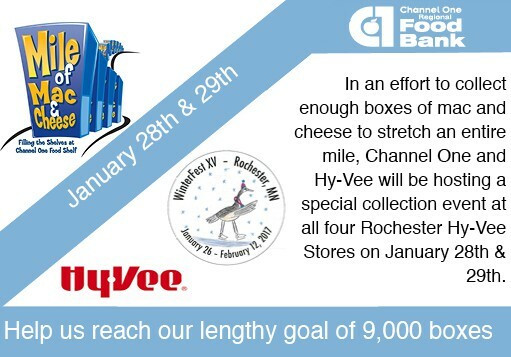 In an effort to collect enough boxes of mac n cheese to stretch an entire mile, Channel One and Hy-Vee will be hosting a special collection event at all four Rochester Hy-Vee Stores on January 28th & 29th. Can you volunteer a couple of hours this weekend? Greet people, hand out flyers, and collect boxes of mac and cheese. Two-hour shifts are available between 10am and 4pm at any of the four Hy-Vee locations. Volunteers must be at least 16 years of age or with a parent or guardian. Please contact Barb Schramm at 507-424-1705 for questions. This event is part of Winterfest 2017!